As far as we were from achievements, trophies and other intangible gaming rewards at the birth of the 90's, even something as stylistically pure as Nintendo's take on Tetris was aware that gamers were beginning to demand something more than a mere name on a high score table as reward for their efforts. The Game Boy's iconic version of Alexey Pajitnov's seminal puzzler included two different game modes and multiple endings that kept gamers coming back, not just for the addictive gameplay but also to see what happened when they finally bested the hardest setting. It seems simple now, but the increasingly elaborate Russian dance routine and, ultimately the launch of the space shuttle that heralded a perfect run, was once the talk of playgrounds and every bit as iconic as the game's legendary soundtrack. Cube-up doesn't have the legendary soundtrack, although it's A, B & C tracks are certainly musically pleasant and evoke a similar Eastern European vibe (unlike the westernised castles on its title screen). 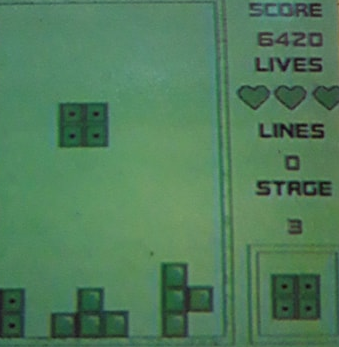 In every other sense though, it appears, at first glance, to be a carbon clone of the Game Boy's take on Tetris. The main menu offers an almost identical look to the the Game Boy title's own. You can again select from 9 levels and a similar number of difficulty settings to begin with (factored by how many blocks are already present when you begin a game. Gameplay, at first, appears to be exactly the same as it's more famous influence. However, two things quickly that somewhat change the way this Tetris clone plays. Screenshots taken from the back of the box. While they are mostly accurate, the block design and heart design have been altered in the final game. Firstly the ability to rotate shapes in both directions is inexplicably not present. 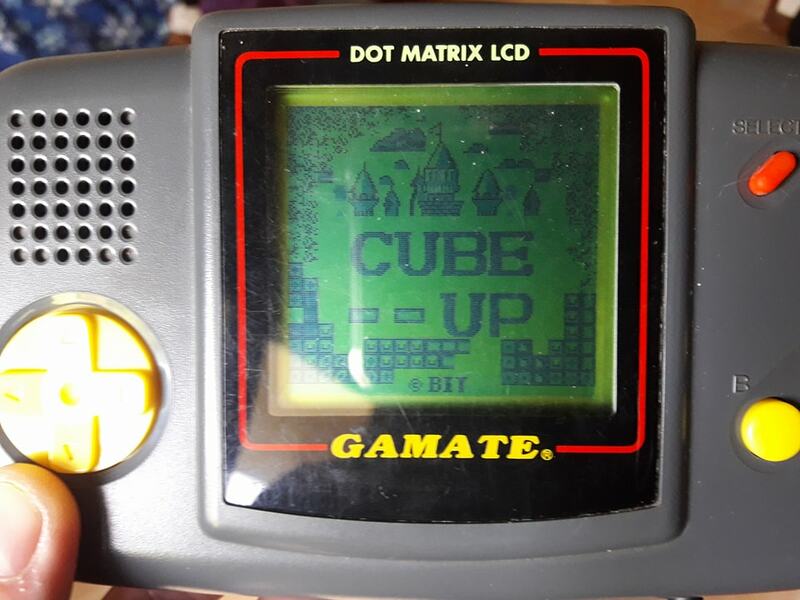 In Cube-Up the goal remains to position your falling shapes in a way that will create horizontal lines that are removed from the game board, however, in the Gamate's world these can only be rotated 90 degrees clockwise as opposed to both clockwise and anticlockwise in Tetris. Oddly all the Gamate's other button appears to do is turn off whether or not you can preview the next shape to fall. It's a bizarre decision that we can't quite fathom the reasoning behind other than change for changes sake. Another major change is the gameplay itself. Rather than the increasingly more hectic challenge of original Tetris, Cube-Up opts to hit the reset button once each of it's 'levels' (marked by clearing a set number of lines) is over. This almost completely removes any sense of threat or need for long term planning as the tiles will all vanish once you reach the preset number of lines. Your score is also only calculated at this point as a screen appears to show you how many single, double, triple or quadruple lines you managed to clear at once. Unfortunately this all makes the game very easy. We were able to get through all nine levels (albeit with the difficulty set to 0) in around half an hour, after which the game merely flips back to level ,1 complete with the much slower rate of falling bricks and lessened sense of danger. The fact that you are also given three lives (marked by hearts) to attempt each run makes it seem as if Bit Corp was deliberately attempting to weaken what made the original game so maddeningly addictive in the first place. Thankfully a third, previously reported flaw with the game turned out not to be true. The normally reliable Gamate compendium hosted here reports that the classic Tetris ability to move a block to the left or right for a fraction of a second once it has fallen is not present in Cube-Up. Thankfully, this turned out not to be the case and I'm a little baffled as to why it was reported as a truth on the other website. Perhaps it was something fixed in an alternate version of the game (our review copy is the Italian version). Who knows. 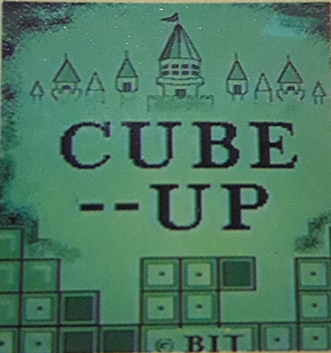 After the attention to detail that went into replicating other aspects of the Game Boy Tetris feel with Cube-Up, it's disappointing that its signature endings were seemingly deemed unnecessary. Cube-Up still has that addictive Tetris gameplay but it's lacking the challenge and sweaty palm moments of its predecessor. While it's certainly a noble effort for the Gamate and one of its most playable titles, like so many other clones and indeed it's parent handheld itself, it just can't quite match it's inspiration in terms of design. Cube-Up is a pretty good game of Tetris, it's just infuriating that with a little more thought it might easily have been a great one.